The high pitched fervor over ‘big data’ has died down a bit, but only because companies are more focused on putting their noses to the grind stone to determine how to more effectively collect and analyze data, of all sizes, to improve their business performance. The Center on Global Brand Leadership, in conjunction with the Aimia Institute, conducted a global study of more than 8,000 consumers to look deeper into the types of data consumers choose to share with companies, and what factors drive their willingness to share this data. We encourage you to examine our full report, What Is the Future of Data Sharing?, which offers information and insights on consumer attitudes towards data sharing, how those views are affected by industry category and country, and how brand trust positively impacts a willingness to share data. In this piece, I will highlight three particular areas to help businesses think more strategically about how to better influence their customers to share data, and create more meaningful relationships with them. This categorized consumers according to whether or not they had: 1) made up personal details to avoid giving away real information, or 2) had taken steps to limit companies from tracking them online. This categorized consumers according to their attitude towards sharing personal information to receive relevant offers and discounts. Defender (43% of survey participants): Consumers who are not happy to share and are guarded against companies asking for their data. Savvy and in control (24% of survey participants): Consumers who are happy to share, while keeping control of how much, when, and with whom. Resigned (23% of survey participants): Consumers who are not guarded, but aren’t happy about sharing, either. Happy go lucky (10% of survey participants): Consumers who are not guarded against sharing their data and are happy to do so. One of the surprising things we found was that 70% of the people who are happy to share their data for relevant value from a company are also taking defensive actions at times to protect the data they share. Being attentive about one’s data and being happy to share it are not mutually exclusive. Most interestingly, among all four Mindsets these “protective but happy to share” consumers – the Savvy and In Control mindset – are more comfortable with how companies handle their data, more willing to share various data points, and more influenced by brand trust. While we are wary of making predictions of generational attitudes into the future, we do believe that the impact of growing up in a hyper-connected society will remain as generations grow older. Given this, the much larger percentage of Millennials and Generation X members in the Savvy and In Control mindset should offer companies hope for building stronger consumer relationships over time. What is the takeaway for companies? In order to build a “win-win” scenario with your customers when it comes to collecting their data, a company must provide transparency about how they are using data and also give consumers a level of control on how they choose to share their data. In addition, companies must demonstrate how customers will get value from sharing non-required data points. Not surprisingly, consumers show clear interest in traditional loyalty/rewards program offers and benefits. Sharing an e-mail address in return for an offer was by far the most common piece of data consumers were willing to share, and this was true across all age demographics. When looking towards the future, however, we found that younger generations – Millennials and Generation X – were up to twice as likely to share other non-required types of data. For example, 23% of Millennials and 16% of Generation X were willing to share their mobile phone data, as averaged across all 10 offers, while only 11% of Boomers and 8% of the Silent Generation were willing to do so. As the data shows, consumers report greater interest in offers that are more direct and financial in nature – rewards, cash back, coupons – but a majority do also show interest in offers that are less direct and more experiential – recommendations and tools to help them make decisions. Given this, firms have a real opportunity to seek information from their own customers and develop personalized offers that match the interests of different groups of customers – sometimes at lower costs than promotional efforts with financial incentives. To better understand where the future might lie for companies, we also wanted to examine new kinds of value that are being developed out of personal data sharing efforts. Netflix and Amazon, for example, spurred the use of aggregated customer data to improve individual user experiences through product recommendations. And services such as Mint and Billguard are compiling financial information and providing insights back to consumers in order to help them make better decisions and protect against fraudulent or unauthorized finance charges. 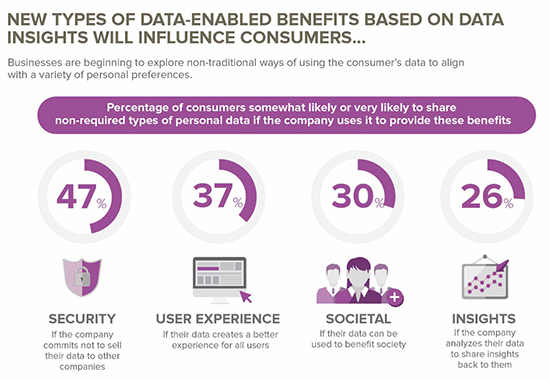 We classified these new efforts as “data-enabled benefits” and asked respondents how likely they were to be interested in exchanging non-required personal data for such offers. Given the fact that these new types of benefits entered the marketplace in just the past few years, we were encouraged that many consumers already agree that there is an interesting value exchange to be had by exchanging their data in return for these benefits. As firms constantly aim to innovate and develop creative new experiences for customers, this data points to a clear opportunity for them. Companies can build their brand and strengthen customer relationships by crafting value-added features for customers that are developed by analyzing and sharing insights on the very data that they hope consumers will share with them. At the Center on Global Brand Leadership, we were delighted to host our 8th annual BRITE conference this March. BRITE ’15 continued our aim to present a range of diverse content, with sessions that ran from the marketing insights and initiatives of Doritos to a discussion of whether the future of artificial intelligence and robotics will help or hinder humanity. One clear theme that ran through a several sessions this year was the influence data will have on brand building and business development. The hype cycle around the specific phrase “big data” has waned, because companies are now driven by how to effectively extract value from, and avoid the dangers inherent in, collecting and connecting massive amounts of data. When it comes to developing loyalty, the Doritos target audience is no picnic. “Young snackers are promiscuous,” Mukherjee stated, “They’ll eat cardboard if it tastes good.” Given these dual insights, her challenge was to build something surprising, exciting, and most importantly scalable. At last year’s SxSW, her team did this by inviting the world to take part in its Doritos concert event, permitting fans to watch online and literally take control of the event by choosing lighting effects, songs that should be played, and what order artists should perform. This ‘young and hungry’ insight also helped the brand redirect some of its marketing spend away from large TV spots. Instead, it looked for alternate opportunities to reach these young and hungry consumers, like partnering with the videogame Call of Duty and creating Taco Bell’s Doritos Locos Tacos. These tacos created so much buzz in limited release that six new manufacturing plants had to be built to meet the expected demand of the nationwide launch which spurred a 13% same-store sales increase in Q2 2012. From the first teases of data coming out of a new research effort between our Brand Center and Aimia, we see evidence that consumers are right now suspect of companies creating this utopian future, but they are also hoping for it. We looked at six industry categories and found that consumers don’t report much comfort in how companies handle their personal data, with all but financial services below a 50% comfort level. But, when asked about all kinds of specific data items – name, email, website history, social network access, etc. – roughly 80% of our respondents were more willing to share all of these pieces of information with a brand when they trusted it. The start-up Billguard now has a million people voluntarily sharing access to their financial accounts because they collectively crowdsource fraudulent activities and save each other money. Founder and CEO Yaron Samid stated that Billguard is built as a trust brand and thus it is very careful about how to use all this data and work constantly with their community to uncover what additional offers or opportunities are viewed as truly added value. At The Metropolitan Museum of Art, against the Chief Digital Officer’s better judgment, a decision was made to require visitors to submit their email when connecting to the museum’s free Wi-Fi. Within a few months, however, over 100,000 valid new email addresses had entered the museum’s database. As CDO Sree Sreenivasan told the BRITE audience, “What is the lesson there, that your CDO may not know anything he is talking about… but more importantly, be open-minded with any new idea.” If you provide true value to people, they are often happy to give up some information in exchange. Chris Wiggins, Chief Data Officer at The New York Times, noted that he spends less time looking at online article clicks since the paper aims to generate trusted and loyal consumers that want to support the magazine with a subscription, rather than just gather eyeballs that the company can sell advertising against. At BRITE we also noted that large swaths of the new data deluge are going to be collected not directly from people, but by devices around the world that are joining the Internet of Things. By 2050, estimates are that anywhere from 30 to 75 billion devices will be connected to the internet. The hype around the Internet of Things is often connected to devices used by everyday consumers. And at BRITE ’15 we had the pleasure of hearing Billie Whitehouse, Founder and CEO of Wearable Experiments, talk about her company’s efforts to entwine articles of fashion with the internet. This ran from the practical – Navigate, a GPS jacket that gathers data to help guide you through major cities [video] — to the, shall we say, more entertaining side of things – Fundawear, for which you’ll just have to watch the clip [video]. But beyond this hype, the reality is that just as many, if not more, of these connected devices will be part of the industrial economy – think of areas such as transportation, city planning, and manufacturing. In a new research collaboration that David Rogers and I are conducting with SAP, we find that for most firms, the top priority in implementing an Internet of Things initiative is gaining efficiencies and cost savings, with revenue as a secondary objective. We also found that depending on the firm’s core business case – cost savings vs. revenue – the value firms sought to extract from data collection was different. Increasing the visibility of operations or improving customer service and decision-making rose to the top in firms driven by cost-savings, while revenue-focused firms were driven by opportunities to provide more customized products and services, gather greater customer insight, and create new business models. But for each of these companies, the top barriers in developing these initiatives were the same – data privacy and security threats. Everyone is aware that these connected devices have the potential for great benefit, but attention to the privacy and security of the data they collect is paramount to their long term success. 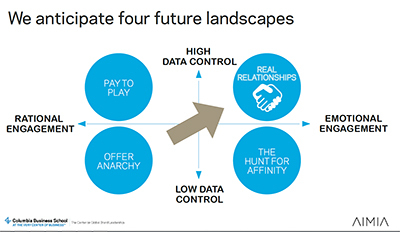 As Martin Hayward told the BRITE audience, in many markets and categories the current use of data sadly leans more towards ‘offer anarchy,’ with companies seeking only to reach more and more consumers with purely transactional deal-based opportunities, all aimed at short-term immediate sales. Our data future will hopefully be more utopian, and not draconian, if companies and their stakeholders are able to build mutual trust and a rewarding value exchange. How are you treating your data and building your relationship with stakeholders? I landed in Paris just as the NSA story was breaking, and Europeans were waking up to the extent of their American surveillance. Made for a lot of interest in my speech on big data and innovation to CEOs of the travel industry the following day. If any industry will be shaped dramatically by the revolution in data and business practice, it should be travel. Travel transactions have already shifted almost entirely online, numerous touchpoints and complex customer experiences allow for wide-ranging innovation, and airlines were an early pioneer in applying dynamic pricing algorithms to optimize “yield” from each flight’s allotment of seats. And yet, over the course of two days of meetings and conference events, I discovered the travel industry is grappling with the same issues as every other industry in trying to make “big data” work to the benefit of their customers, their business models, and their bottom lines. 1. Customer level data is paramount. Data is no longer about knowing that “69% of customers prefer X.” As data has shifted from the survey paradigm to real-time analysis and unstructured data, the value is in knowing that “customers who buy X, and do Y, are 140% more likely to want Z.” This value requires linking together different behaviors and data signals at the level of the individual customer, to unlock insight and deliver much more customized value. As of recently, the airline industry has not even retained historical purchase records, literally “throwing out” the unique ID of each customer transaction after the trip, to recycle the record locator number for another customer. 2. Customers need to see value, to allay privacy fears. With an ever-increasing spotlight on issues of data privacy, from both governments and corporations, gathering and using customer data surreptitiously is no longer an option. And to earn the trust of customers to use their data transparently, companies need to demonstrate the value they are delivering to them. When customers see actual benefits, from personalization, offers, and unique services, they are much more willing to accept the anonymized use of their data by your business. 3. Loyalty programs will be the leading edge of opt-in data. The most transparent and familiar paradigm for customers to recognize a value exchange around data is loyalty programs. Huge numbers of customers already participate in at least one such program, and understand that they are opting in to allow the company to deliver rewards based on behaviors it is tracking and responding to. For companies with limited customer-level datasets (e.g. those who traditionally sell only through intermediary channels), loyalty programs are the first step down the path of developing their own strategic data asset. 4. Data is political, not just technical. Most conversations about big data take for granted that the biggest hurdles to assembling and linking diverse and enormous sets of unstructured data are technical challenges. But in the real world of businesses, the toughest challenges are political. Sharing and linking of data, in order to assemble a complete picture of customer behavior, is very frequently obstructed by reluctance to share between divisions of a single company, or between partner companies. Whosoever “owns” the data wields a great deal of power. The travel industry is struggling to shift to NDC, a new data standard for airline reservations. Why? Because while airlines claim it will allow for much better servicing of customers, online travel agencies (OTAs) fear being cut out of the value chain – disintermediated by their partners.